Chloe’s colourful design transforms roundabout. Home / Blog / Chloe’s colourful design transforms roundabout. 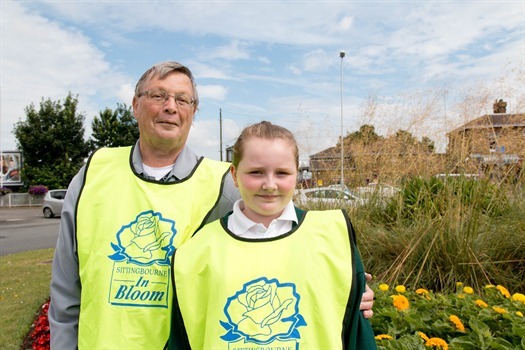 Chloe Archer who attends Minterne Junior School, became what might be the final winner of the Sittingbourne in Bloom Design the Station Roundabout Competition. On Wednesday morning Chloe, accompanied by grandad Mr Robert Jones popped along to see first-hand her floral design which has been lovingly recreated by Blenwoods, the Council’s landscape contractor. Chloe who managed to beat off competition from hundreds of other pupils attending Sittingbourne junior schools said she was excited to have won. Mr Jones told us that she is very creative and enjoys drawing and wouldn’t be surprised if she founded a career in design.